Though we are no longer shocked at the callous and indiscriminate nature of Saudi coalition attacks on Yemeni towns, we are surprised that major US networks like CNN have actually decided to cover coalition war crimes for a change. Early on Thursday a coalition air attack scored a direct hit on a school bus packed with children as it drove through a crowded market place. Some of the images to come out of area hospitals currently treating the wounded confirm that it's mostly children among the casualties. 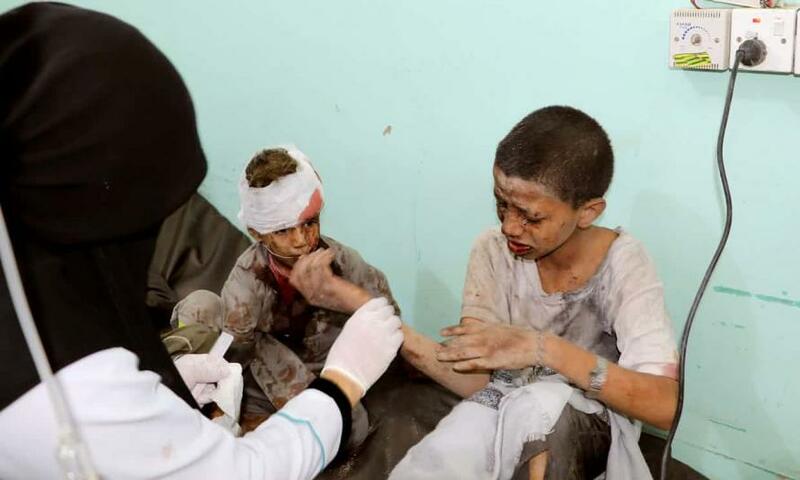 International media featured photographs of wounded children being treated in area hospitals in the aftermath of the airstrike, which happened in Dahyan, in the rebel-held north of Yemen; however, most of the images of dead and wounded released by Yemeni media accounts are too graphic and disturbing to show. We've noted many times before that Saudi coalition war crimes in Yemen, which have become a weekly if not almost daily occurrence, has for years been met with mainstream media silence. For example as we recently noted a study that found that in one year, MSNBC covered 'Stormy Daniels' 455 times and the 'War In Yemen' 0 times. Both the US and UK have since 2015 or prior, worked closely with Saudi and Emirati forces in their Yemen campaign to defeat Shia Houthi forces, which includes staffing intelligence command centers to assist in targeting, as well as providing aerial refueling for coalition jets. It is also primarily American and British military hardware that's supplying the Saudi military machine. The US has long tried to present its role in the conflict, which as attempting to stave off humanitarian catastrophe in Al Hudaydah, yet as NPR's Steve Inskeep confirmed while reporting from Yemen earlier this year the US military "has provided targeting information, equipment and aircraft refueling to the Saudi air campaign, which has been widely criticized for being indiscriminate and killing civilians in places like hospitals, funerals and homes." In early June the Wall Street Journal characterized the US role in the new operation as actually "deepening" as US intelligence will provide "information to fine-tune the list of targets". While this "deepening" role is supposedly to keep the UAE and Saudis on good behavior, its really a propaganda move to give the American role a fig leaf of "humanitarian" motives. But when entire school buses full of children are being taken out by the Saudi coalition, which receives continuing assistance from US intelligence and military officers, it is perhaps becoming increasingly hard to keep up the charade. The incident comes a day after the State Department spokesperson said the Saudi coalition's ongoing airstrikes on Yemen are legitimate and justified. Meanwhile Washington's stance of indifference toward civilian deaths, which according to recent reports and human rights groups includes upward of 70,000 killed, appears to have emboldened the Saudis. Statement from Rep. Ro Khanna, D-CA: "The Saudi-led coalition intentionally targeted a bus full children on their way to school. The U.S must stop supporting these barbaric attacks. Now more than ever we must end our complicity in this slaughter." In response to early reports of a rising civilian death toll as a result of Thursday's airstrike on the school bus and market place, the Saudi Press Agency cited official coalition spokesperson Turki al-Maliki as saying: "The targeting that happened today in Saada province was a legal military action to target elements that planned and executed the targeting of civilians in the city of Jizan last night, killing and wounding civilians." The next State Department press briefing is going to be interesting.